Read More Mysteries | Reviews of mysteries old and new…with random thoughts about coffee and beer thrown in. 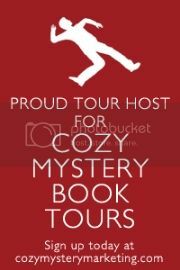 I recently had the pleasure of reading and reviewing Amy Beth Arkawy’s Dead Silent as part of the Cozy Mystery Book Tours. Dead Silent is the second installment in the Eliza Gordon Soup Opera mysteries. I had planned on reading Killing Time, the first Eliza Gordon mystery, before reading and reviewing Dead Silent, but life somehow got in the way. It actually worked out, because I now don’t have to wait for the next book and can just go back to where it all started! It’s summer time in Goodship, NY and the mercury isn’t the only thing that’s rising. Everyone in town is beside themselves trying to figure out who is behind The Goodship Grapevine, an anonymous website that has been revealing less-than-flattering (and at times less-than-legal) tidbits about the good people of Goodship. If that wasn’t enough to turn up the heat in Goodship, Paul Hackett, WSHP’s resident shock jock, is found strangled to death with his own headphone cord. Scrawled on the window are in red lipstick are the letters, “V.O.S.” And what about “The Quiet,” a cult that’s been peppering the town with flyers in hopes of gaining more followers? Eliza Gordon, one-time actress and proprietress of the Soup Opera, is determined to get answers. Unfortunately, her sleuthing is putting a strain on her budding romance with Police Chief Tom Santini. Can Eliza (and her trusty sidekick Midge) solve the mystery before things boil over? There is something about mysteries set in small towns that make them especially cozy, and Dead Silent is no exception. I was especially impressed by the fact that there were multiple mysteries going on in such a small town, yet it never felt that there you were running out of suspects. Having the book take place in a small town also allows you to really get to know the characters–and Goodship’s townspeople do not disappoint. They are a motley, lively bunch and you will want to be part of the Soup Opera crowd (you’ll also probably want some soup). Eliza is an extremely smart and likable heroine, and you will find yourself rooting for her not just to solve the mystery, but as she sorts through her relationships. I look forward to the next installment just to get to know her better. Dead Silent was extremely fast-paced and the resolution almost snuck up on me. I actually read this book in one sitting; the plot really drew me in and I could not wait to find out if the two mysteries were connected. I also really enjoyed the fact that most of the information is given to you via conversations between characters, which made me feel like I was actually there and listening. As I mentioned earlier, I am glad that I have not yet read Killing Time so I can just go right back to Goodship instead of having to wait for the next book. As Eliza herself says, “you never know just how interesting it might get.” I look forward to my next trip to Goodship. FTC Disclaimer: I was provided with a free copy of the book as part of the book tour. This did not influence my review, and all opinions expressed are my own. I just wanted to pop in and apologize for the recent silence on the blog. One of my favorite uncles passed away late last week and I just haven’t been up for posting. I’ll be back on Thursday with a new post. I hope everyone had a good weekend. Today is Memorial Day in the United States, and I want to take the time to thank all the service men and women–and their families–for all they sacrifice to make our lives safer. Welcome to Providence, Ohio, home to Fromagerie Bessette and its proprietor, Charlotte Bessette. Exciting changes are afoot in the Cheese Shop (as Providence’s residents call the Fromagerie Bessette), including the addition of a wine annex and plans to sell gourmet goodies, artisanal breads, and gift items like olive wood-handled cheese knives from France. Unfortunately for Charlotte (and even more so for the victim), one of those beautiful knives ends up buried in someone’s chest not long after the last Travertine tile had been laid–and someone very near and dear to her is the prime suspect. Can Charlotte figure out the killer in time to save her beloved grandmother and The Cheese Shop? The short version of my review: A Long Quiche Goodbye was as good a read the second time and I would highly recommend it to cozy fans. As I mentioned in a previous post, however, do not read this book on an empty stomach. Or if you don’t have any cheese in the house. It was all fun and games until I was reading on a Sunday morning and got to the part where Charlotte makes herself a breakfast of sourdough toast with Dalmatia fig spread with a thick slice of Perrin Haute-Savoie…and all I could do was stare sadly at my almost bare cheese drawer. The Long Quiche Goodbye embodies cozy. Not only is the Cheese Shop cozy, but the town itself is cozy with an ice cream shop, a quilt shop, a Village Green–it’s the kind of place that makes me wish I lived in a small town. I also love books where the setting becomes every bit a character as the people who inhabit its pages. I don’t think I’ll ever walk into another cheese shop and not expect it to look like Fromagerie Bessette the same way I expect every mystery bookstore to look like Carolyn Hart’s Death on Demand, and every tea shop to look like Laura Childs’ Indigo Tea Shop. Another thing I really enjoyed about this book was that even if Providence is a small town, there are enough suspects to keep you guessing. It’s not the kind of small town setting where you start with six suspects and three of them end up dead. There is also a good mix of long-time residents, newcomers, and visitors that keeps the novel from crossing from cozy into claustrophobic; I look forward to getting to know all the characters better as I read the subsequent books. Lastly, there is a nice surprise at the end that will make you want to read the next book ASAP. I highly recommend A Long Quiche Goodbye, and look forward to Lost and Fondue. On a related note, Avery Aames, writing under her real name Daryl Gerber Wood, is releasing Final Sentence, the first title in A Cookbook Nook series, in July. I’ve already pre-ordered my copy, and am very excited to start another series. Happy reading! Let me know what you’ve been reading–I’m always on the lookout for more books to read and authors to meet! P.S. As I promised last week, I have been noodling around with a new section of the blog that will include A Long Quiche Goodbye. I will talk about that in a separate post–I need to iron out a few glitches. Hope you’re having a good week and see you again soon! P.P.S. If you’re new to the blog, check out my previous post where I write about having the pleasure of meeting Avery Aames and Rochelle Staab (of the Mind for Murder series) at a recent book signing. I was fortunate enough to attend Avery Aames (Daryl Wood Gerber) and Rochelle Staab’s author presentation before their book signing (they were both so gracious). I had read A Long Quiche Goodbye a while back and was looking forward to reading the rest of the series. The part I enjoyed the best was listening to them talk about how their books take shape and how readers have become so invested. I particularly enjoyed Avery’s story about having encountered numerous folks from Wisconsin wanting to know why The Cheese Shop Mysteries are set in Ohio. I am looking forward to reading the Mind for Murder books. I picked up a copy of Who Do, Voodoo at the signing–I’m the kind of reader who likes to start with the first book in the series whenever possible. I was patient and waited to pick up Dead, White, and Blue from Mysterious Galaxy on Saturday instead of running out on Tuesday. I also bought two other “firsts”: Liz Lippeman’s Beef Stolen-Off and Victoria Hamilton’s A Deadly Grind. I’m going to have to upgrade my to-read bedside basket to a to-read bedside steamer trunk soon! The rest of my weekend haul included all The Cheese Shop Mysteries and Lucy Burdette’s Topped Chef. I had loaned my copy of A Long Quiche Goodbye to a friend so I decided to just buy another copy. Trivia Time: As you know, I am a big Murder, She Wrote fan so you can imagine how tickled I was to find that Avery Aames (as Daryl Lynn Wood) was on the “Simon Says, Color Me Dead”). I am two-thirds through my (re)reading of A Long Quiche Goodbye and Tuesday’s post will be my review along with a new section of the blog! In honor of Throwback Thursday, what was your first book? Have a good weekend, everyone! See you Tuesday! P.S. I decided to reread Avery Aamess’ A Long Quiche Goodbye since it’s been a little while. So far, the book is as fun as I remember. I may use my review to introduce a new blog section I’ve been noodling with for a while. Oh, my copy The Bletchley Circle is in the mail! Happy Thursday! Say Cheese (and Coffee)! I was all set to blog about how sad I was to see The Bletchley Circle end when I saw this piece of awesomeness. Yes, ITV has renewed The Bletchley Circle for a second season! Since my happy dance is definitely not fit for public consumption, I’ll link to George Takei‘s instead (since he just makes everything cooler). I need to go and cross a few things off my to-do list so I can focus on the good stuff, like reading Lost and Fondue in preparation for picking up To Brie or Not to Brie this Saturday at Avery Aames’ book signing. I’m actually behind on this series, so I actually need to get Clobbered by Camembert as well. In other non-mystery news, I discovered Caffe Calabria yesterday and I may need to move to North Park. I’m ashamed to admit we end up spending time in our neighborhood and have yet to explore a lot of San Diego. The person I was meeting with suggested we meet there and I am so glad we did. I brought home some of the El Salvador blend and it is amazing. Well, I’m awake! 😉 Have a good Thursday and see you soon! I am a HUGE Carolyn Hart fan. HUGE. So you can just imagine how excited I was to contribute to Cozy Mystery Book Reviews’ post celebrating her 50th release, Dead, White, and Blue. Here is the link to the post, which includes an interview with Carolyn herself. It’s also been so nice to read numerous comments about how she is as lovely as you imagine her to be from her books.